The 10th CRACK International Art Camp (CIAC) 2016 was launched at Smaran Matshya Beej Khamar in Kushtia yesterday. Jointly curated by Rajarshi Das Gupta from India and Shawon Akand from Bangladesh, the camp has featured 19 artists from six countries of the world. The participating countries are Greece, Japan, USA, India, Nepal and Bangladesh while the participating artists are Anil Prajapati (Nepal), Bibhu Nath (India), Hiroko Tsukamoto (Japan), Kamal Pruthi (India), Mahesh Bastakoti (Nepal), Mariva Zacharof (Greece), Mohan Jangid (India), Muna Bhadel (Nepal), Pavitra Mehta (USA), Pramila Lama (Nepal), Rupsa Kundu (India), Sohini Sengupta (India) and from Bangladesh - Anadi Boiragi, Farah Naz Moon, Mahadi Masud, Mridul Kanti Goshami, Sultana Sharmin Akhi, Tahmina Hafiz Lisa and Zahid Hossain Sagor. 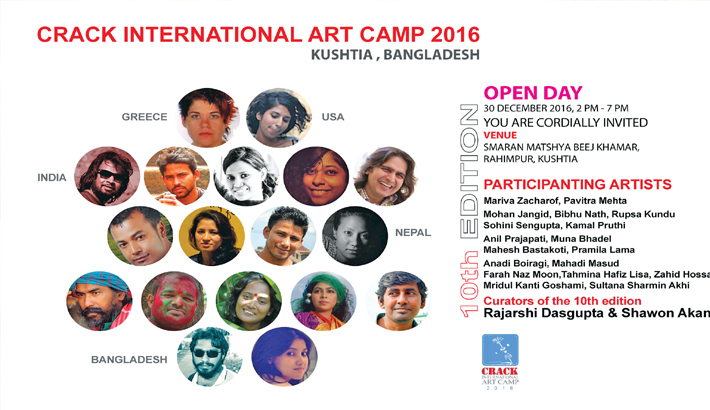 CRACK International Art Camp in Kushtia is an initiative by some young activists of different cultural fields in Bangladesh. It started with the leadership of Artist Shawon Akand in association with Artist Delowar Hossain in Kushtia (a south-westerndistrict of Bangladesh) since 2007. The organizers of the Art Camp believe that Art is a complex process and is inseparable from life and living styles. They also think that every form of art has an inter-relation and it is necessary to develop these connections to create a favorable environment for the progress of artistic practice. Therefore, not only visual artists but also theatre activists, photographers, film makers, psychologists, poets, writers, journalists, actors and people from many other disciplines are welcome in this art camp. The camp will observe its closing day Friday as the Open Day for all viewers to see the artworks and meet the artists at the camp from 02.00pm to 07.00pm.